Many people from across all age groups suffer from a variety of skin problems and fade creams are especially helpful in treating acne scars, dark spots, and discolorations. OTC fade creams work well in evening out skin tone that has turned blotchy due to aging, too much sun exposure, or hormonal issues. This article will focus on the best fade cream for dark spots on African American skin by comparing three products within the same price range for effectivity and potency as well as the immediacy of results. Admire My Skin Ultra Potent Brightening Serum is contained in a 30 ml bottle. The serum is a clear light amber color and is made up of active ingredients such as 2% hydroquinone, kojic acid, salicylic acid, azelaic acid, vitamin C, and Lactic acid. It specifically targets melasma, dark spots, and hyperpigmentation by fading them. It should be applied nightly for around four weeks for results. This product works on all skin types and colors, from Caucasian and Asian to African-American hues. It is oil-free and won’t break you out. Since it contains the highest amount of hydroquinone allowed without a prescription, it works faster than others and results can be seen in as little as a week’s time.It works great on spots where AHA, glycolic, and other lightening products won’t work. A bit of burning sensation on spots where this product is applied could be felt. The area may look darker too for the first few days before the skin peels off to reveal a lighter and more even surface. It can be a bit drying, so moisturizer is a must while using the product. Since the product contains AHA/BHA ingredients, prolonged exposure to the sun is not advised. Sunscreen is also necessary as the product works by peeling off the pigmented skin. 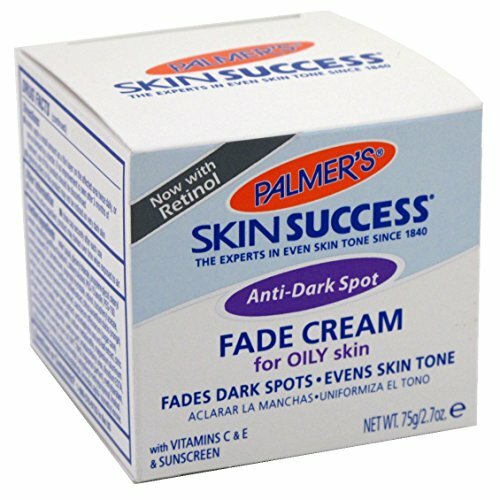 Palmer’s Skin Success Anti-Dark Spot Fade Cream comes in packs of two at 2.07 oz per jar. The cream is white with a thick consistency. Its active ingredients include 2% hydroquinone for lightening skin and octisalate 3% for sun protection. It also contains retinol for improving fine lines and boosting collagen, Vitamin E to provide antioxidant protection, AHA acids for increasing cell turnover, Vitamin C for brightening the skin, and enhanced moisturizers for deep skin nourishment. It promises to work on post-acne scars, age and dark spots, and skin discoloration. Results may be seen in as little as a couple of weeks. This cream has variants for all skin types. It works on all skin tones. Only a minute amount is needed so the product will last a long time. Since it already contains sunscreen, there is no need to buy a separate product. The cream also works on some burn scars and mosquito bites that have turned dark. The price is pretty low compared to its value. Effects can be seen in as little as a week although product leaflet mentions three months of continued usage at least.It controls shine and leaves a beautiful matte finish. The product has a very thick consistency that may not be suitable for hot weather. The fragrance is quite lovely although some may feel it is too overpowering. It includes seven mildly to highly comedogenic ingredients such as ascorbyl palmitate, Ceteareth-20, Cetearyl Alcohol, Dimethicone, Glyceryl Stearate, Isopropyl Myristate, and Sodium Lauryl Sulfate. 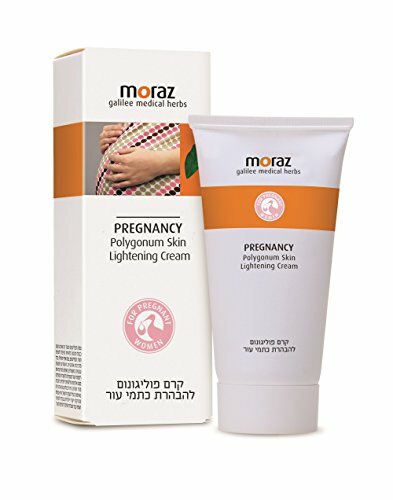 Moraz Pregnancy Polygonum Skin Lightening Cream comes in a 50 ml tube. Its active ingredients are phytic acid, vitamin C, and polygonum extract. It uses 15 medical herbs, the most notable of which is Polygonum, to brighten and lighten skin discolorations. The Polygonum plant extract repairs and protects damaged skin. It is known to assist in growing connective tissues as well as stop hemorrhages and maintain a good complexion. It also contains a range of minerals with healing properties such as flavonoids, tannins, silicic acid, Leucoanthocyanidin, and vitamin C which possess antioxidant, antiseptic, anti-inflammatory, antiviral, and antibacterial agents. The rich minerals and moisturizers in the cream soften the skin, deliver a luminous radiance, reduce lines, and fight free radicals. The cream must be used twice daily and massaged thoroughly to be absorbed. It can be applied all over the body. Results can be seen within six weeks. The product is free of hydroquinone and therefore very safe for even pregnant women to use. There are also no parabens, mineral oils, halogenated preservatives, SLS, or petroleum. It uses all-natural agents instead to promote brightening of the skin and bleaching of dark spots. It is non-greasy, makes the skin feel softer and silkier, and has a nice texture. Since the product also comes in a 50 ml tube, it gives quite good value for money. Moraz Pregnancy Polygonum Skin Lightening Cream also has a light scent. The cream can be used by people of all skin types and races. It doesn’t work as fast as other fade creams in lightening dark spots. Direct sun exposure is not advised while using this cream and you need to purchase a separate product for sun protection. Based on effectivity, Admire My Skin Ultra Potent Brightening Serum is ahead of the pack. It is the most expensive of the three products, but it works on even the toughest spots that other lightening products can’t get rid of. Palmer’s Skin Success Anti-Dark Spot Fade Cream for Oily Skin and Moraz Pregnancy Polygonum Skin Lightening Cream are both effective as well although results are not as immediate compared with Admire My Skin. Palmer’s gets extra points for having sunscreen built-in, but it also gets minus points for including so many comedogenic ingredients in its product. Moraz Pregnancy Polygonum Skin Lightening Cream has the most value-for-money among the three for being the lowest-priced item but having the most content. After reviewing and comparing all three products, we picked Moraz Pregnancy Polygonum Skin Lightening Cream as our top choice for best fade cream for dark spots on African American skin. Although all three work well for all skin types and hues, we feel that Moraz’s use of all natural ingredients sets it apart. It may not work as fast as the other two fade creams, but it does work, is priced just right, and is much safer to use overall.